Large airy rooms that have a cosy and comfortable ambience with its dramatically placed lighting. Each room comes with king size bed and other furnishing, air conditioning, cable TV, well stocked mini bar with en-suite toilet that is complete with hot & cold water, complimentary toiletries & hair dryer. 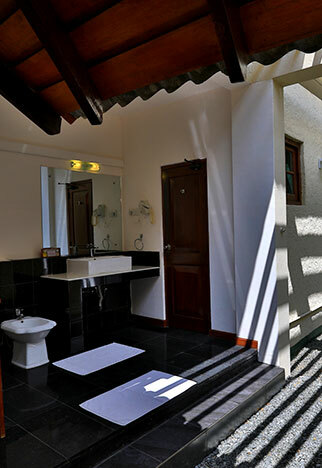 In addition be enthralled with a private balcony and an awesome outdoor Jacuzzi for complete relaxation. At your service, with a wide choice of conveniences that goes beyond the usual.